Art Direction and Cover Art: Nello Dell'Omo Jim Peterik comments: “As a long time enthusiast of Marc Scherer's vocal chops and the expertise of rock guitar goddess Jennifer Batten, you can imagine how excited I am at the release of Scherer/ Batten ‘BattleZone’ album. 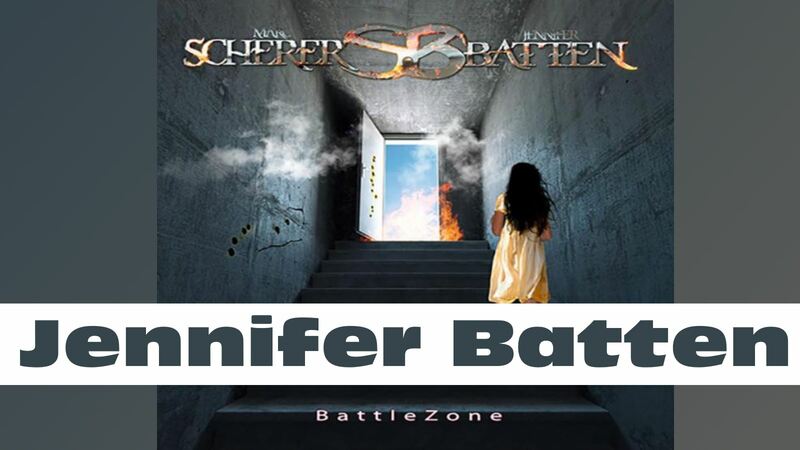 As a song writer and producer, it was a dream come true mining some lost gems from my many years in rock, producing them to a new lustre and even writing three brand new cuts with Marc and Jennifer - Cuts Deep, The Harder I Try and the title track BattleZone. Andrew McNeice and Danette Pahl of Melodic Rock Records gave me the artistic leeway and financial support to create the album of a lifetime. Working with one of the best engineers in the business, Larry Millas, and musicians like multiple Grammy Award Winner Bill Champlin of Chicago, bassist Bill Syniar (formerly of Survivor), Mike Aquino (guitarist and singer from World Stage), and two-time Grammy Nominated saxophonist, Mindi Abair, along with Dave Kelly and Bryan Cole, brought depth and texture to the tracks that is palpable. You can hear our excitement in every song. I guess you can see I'm pumped. It was during one such meeting that Jim and I conceived of an album showcasing his lost musical treasures. Thanks to the contributions of long-time Peterik enthusiast and personal friend Danette Pahl of MelodicRock Records, we now have lift-off!